Hey folks, hope you enjoyed the beautiful weather we had this weekend! (in Western Newfoundland at least). It was too nice to be inside baking all afternoon, so we decided to whip up something simple. We’re talking stove-top rice pudding with partridgeberry sauce!! No ovens or egg-tempering to fool around with, just a couple of stovetop burners, some whipped cream, and a few crushed up Crunchie bars to make this super easy pudding! The inspiration for this dish came from one Nicole had at the Fogo Island Inn a few months back. It stood out because growing up we always had baked rice pudding, whereas this one wasn’t, and it paired so well with the tart berries. So, we did a bit of digging, and it turns out, the Icelanders have been doing it like this for a while! Now, we didn’t want to accidentally poison our family trying to find edible moss, so we went with Crunchie bars instead. We like our rice pudding really rich and creamy, so we used whole milk here. But if you are like us and you don’t really have room for 2 different types of milk in the fridge, you can go ahead and use whatever milk you have on hand. Also, we like things a bit less sweet, especially since we are topping it with literal candy bars. However, if you like a bit more sugar, feel free to add an additional 1/4 cup. If you can’t find Crunchie bars in your area, they are basically just honeycomb toffee covered in milk chocolate. Crushed up Skor bar would also work really well! Also, if partridgeberries are hard to come by in your area, then just substitute with cranberries or currants, or any other tart red berry. This easy pudding uses the natural starch in the rice to thicken - no eggs needed! It can be eaten warm or cool, based on your preference. Combine all ingredients in a medium saucepan over medium-high heat and bring to a slow boil, before reducing to a simmer. Stir often, at least once every 5 minutes until rice is cooked and milk is absorbed, about 30-35 minutes. Remove from heat and set aside. Meanwhile, bring the partridgeberries, water and sugar to a boil, reduce and simmer, stirring occasionally until thickened, about 20 minutes. 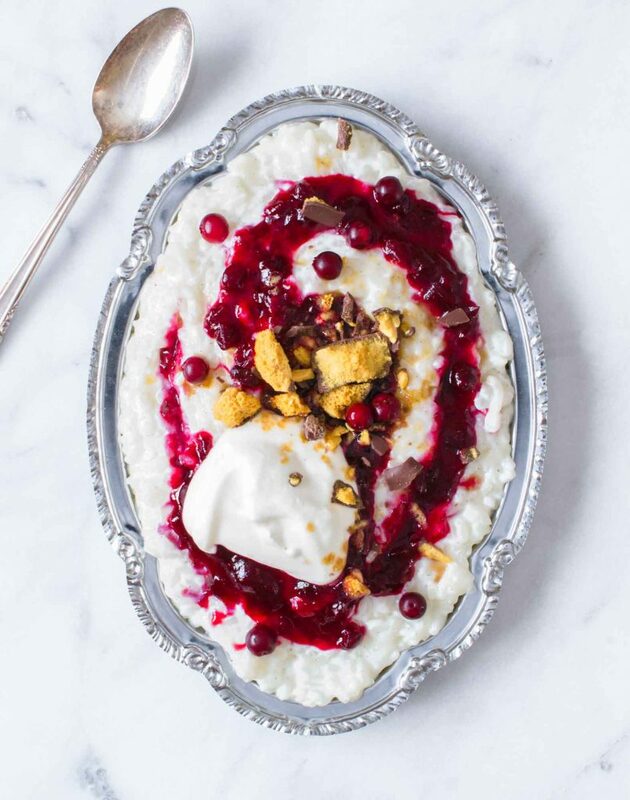 Assemble the rice pudding on a platter or shallow bowl, top with the partridgeberry sauce, whipped cream and Crunchie bits.